One of the most enjoyable aspects of visiting Italy is eating out. From elegant ristoranti to homey trattorie, this country is where you will have some of the most unforgettable meals of your life. Sometimes, however, there can be too much of a good thing. After dining out for days at a time, you may have the urge to prepare a meal for yourself - if you have access to a kitchen while traveling - so you can take a break from the more elaborate restaurant fare and not have to bother with sitting down and being served. Luckily, the wonderful dishes you find eating out are founded on excellent ingredients which are easy to come by at Italian grocery stores, so you can pick up a few things at the local shop or supermarket and throw together a delicious home-cooked meal without too much fuss. 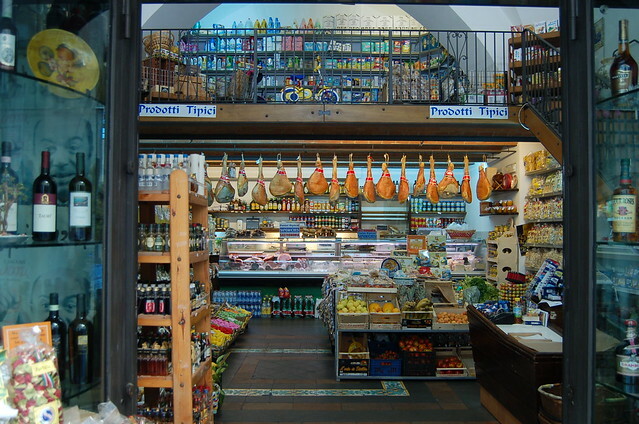 Along with your shopping, you'll also take home the unique experience of viewing Italian culture through the lens of its familiar-yet-slightly-different food shopping venues, from outdoor markets to supermarkets. There are very few 24 hour supermarkets in Italy. Larger supermarkets sometimes have “orario continuato”, meaning that stay open all day from the morning opening to the evening closing time. Smaller neighborhood specialty shops and grocery stores in small towns tend to close at lunchtime - usually from about 1:30 to about 4:30 - and on Thursday and Sunday afternoons. Outdoor markets: This is a great place to purchase fresh fruit and vegetables, fish, and local specialties, especially cheeses. 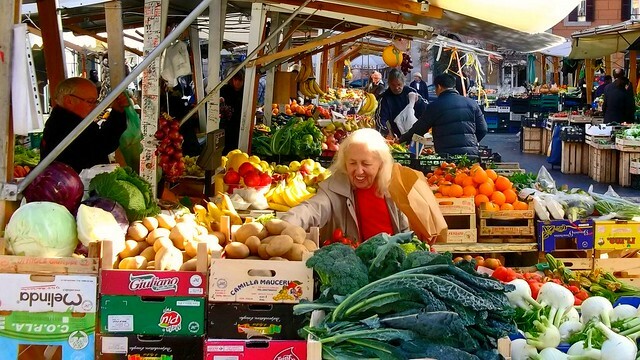 Shopping at an outdoor market is also both a fun and truly Italian experience, where bargaining and bickering are the order of the day and you will be rubbing elbows with the neighborhood housewives and their favored vendors. From spring to fall, the stalls are stacked high with seasonal and local produce...if you see something you don't recognize, you can try your Italian out for an explanation and cooking tips. Specialty shops: Many Italians still buy their bread from the bakery, their meat from the butcher, and their produce from the greengrocer...supermarkets are for everything else. Consider poking around the neighborhood where you're staying and meandering through these often historic, family-run shops. Bakeries, butcher shops, and fish mongers often use a take-a-number dispenser to serve clients, so check when you enter. Greengrocers often prefer to choose produce for you, so it's good form to indicate what you want rather than serving yourself. Delis: One uniquely Italian specialty shop is the gastronomia, which could loosely be considered a deli. Here is where you'll find the best cheeses, cured meats, marinated and conserved olives and vegetables, high-end condiments like truffle sauces, and sometimes olive oil and wine. A gastronomia is the perfect place to pick up all you need for an aperitivo at home. Take-out delis: If you would like to eat at home, but don't want to spend a lot of time cooking, you can opt for a rosticceria. These are delis which prepare hot dishes which can be purchased for carry-out, though some rosticcerie have a few tables set up for clients to eat there, and have everything from lasagna to whole roasted chickens and potatoes. 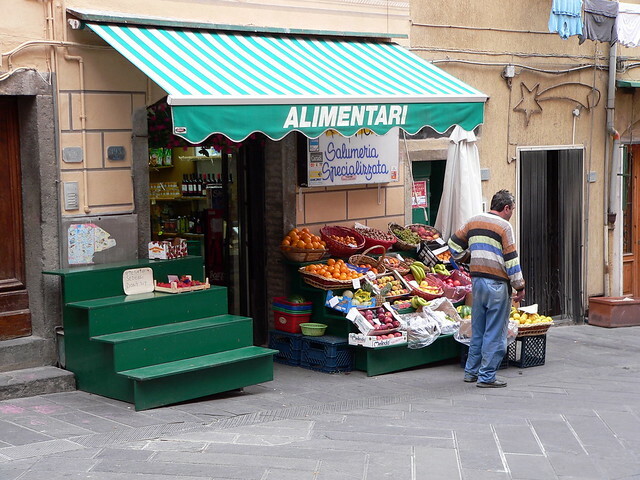 Grocery stores: Small, neighborhood grocery stores are usually called “alimentari”, and carry dry and canned goods, frozen foods, dairy, and have a small deli counter. Larger alimentari may also have a small produce section and a meat counter. You will usually have to shop with a hand basket, and your purchases will be bagged for you. Supermarkets: The most familiar food shopping venue will probably be the supermarket. Though not particularly picturesque, supermarkets do have the advantage of competitive pricing and one-stop shopping. You'll need to have a €1 coin to release a shopping cart (you get the coin back once you park your cart), and a reusable shopping bag (which you can purchase at the check out for €1) which you will use to bag your own purchases. 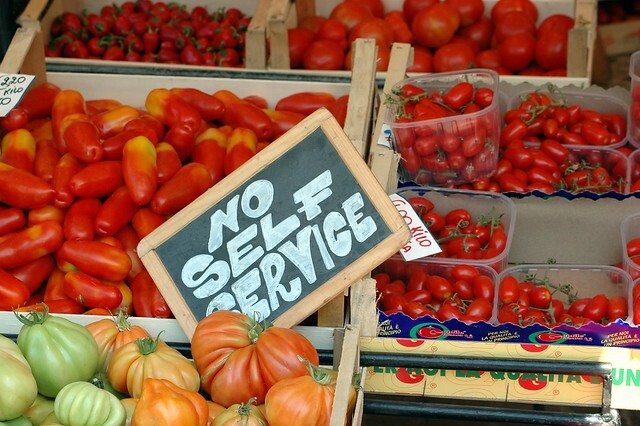 Most supermarkets have self-service produce sections, where you need to weigh your fruit and vegetables yourself. Select your items wearing the plastic gloves provided, then place them in a plastic bag. Place the bag on the scale, and select the picture that corresponds on the scale's screen. The scale prints a bar code sticker, which you then stick on the plastic bag. Fresh bread is kept behind the deli counter, so you will have to wait in line at the counter and request it from the server. Eggs are not refrigerated, so you'll find them on normal shelves. Milk can be found in the refrigerated section in shops which sell fresh milk. Otherwise, UHT preserved milk is much more common and found on normal shelves. Wine and liquor are sold in normal grocery stores, usually in a dedicated aisle.